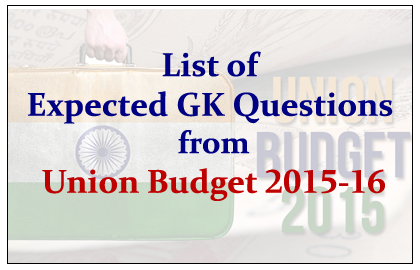 The List of Expected GK Questions from the Union Budget 2015-16 was given below. Candidates those who are preparing for upcoming competitive exams can use these questions. 1).As per Union Budget 2015-16, New IIM was yet to be launched in which of the below two states? 2).How much amount was allotted in Union Budget 2015-16 for Infrastructure Sector? 3).As per Union Budget 2015-16, Service Tax will be increased to ______. 4).Government has planned to provide “On Arrival Visa” for _______ countries. 5).What is the name of the new pension scheme in which Government will contribute 50% of Premium per year? 6).New PG institute for Horticulture will be launched at_______. 7).Where was the New IIT was planned to be launched as per Union Budget 2015-16? 8).How many Ultra Mega Power projects were planned to be constructed with capacity of each 4000MW? 9).Among the following which are the two new programs that launched in the Union Budget 2015-16? 10).Name the bank which was launched to encourage the first generation SC/ST entrepreneurs? 11). A University for Disability Studies was to be started at________. 12). How much fund was allotted for Electric Cars production? 13). How much amount was allotted for Defense? 14).Among the following states, where the new AIIMS is NOT planned to set up? 15). As per Union Budget 2015-16, how many of the Secondary Schools will be upgraded?